Our Organza Snow wedding invitation is one of our most popular for winter weddings. The collection is made with a large backing of organza and topped with satin ribbon in the colour of your choice and finished with a crystal diamante snowflake. This wedding invitation is very popular with our winter wedding couples and is often made in silver, white, light blue or red colour schemes, although we have made them in many other colours as well. Another order we completed recently was our Organza Snow design which is perfect for winter weddings with the large and very sparkly snowflake embellishment. This customer ordered her save the date cards and wedding invitations at the same time in white and silver. All of our wedding invitation designs are available in a variety of styles including a pocket, wallet, folded or flat style depending on your choice and budget, with customers often choosing one style for their day invites and another for the evening. We also have a full range of wedding stationery available in each of our designs including Menu’s, place cards, table plans and guest books. Today’s featured design is our Bloomsbury pocketfold with a damask print, satin ribbon and a crystal embellishment and is often chosen by couples having a vintage style wedding due to the damask print and pearls. This normally comes with a pearl on the ribbon, but the customer requested the diamante used on our Glamour style and we think it works really well! This customer chose to have a black and white theme which looks great and it can be printed in any colour scheme with ivory and light pinks being a popular choice. This wedding invitation comes in a variety of styles including a pocket, wallet, folded or flat to accomodate various budgets and customers often mix and match the styles for the day and evening invitations. A full range of wedding stationery is available in this design from wedding table plans, orders of service and place cards to thank you cards, guest books and menu’s. The Bloomsbury design can be made in your colour choice and the embellishment can be changed if you would prefer. For further information and a price list please visit our Bloomsbury design page or visit our website www.bubblycreations.co.uk to see our full collection. We have realised that we don’t blog enough and we don’t do enough features of the orders we have been working on, so have decided to change this. A couple of times a week (hopefully) we will be doing a blog post and showing photos of what we have been working on as sometimes we completely forget to do this and we have been given feedback that customers like seeing the different stationery. This stationery range consists of a square diamante embellishment which is incredibly sparkly and is threaded through satin ribbon and is shown in a Wine colour. It is a very simple design, but is a popular design for couples who want a classic design, but can’t resist a bit of bling! Our second blog is about a Boutique order we worked on last week for a wedding this month. 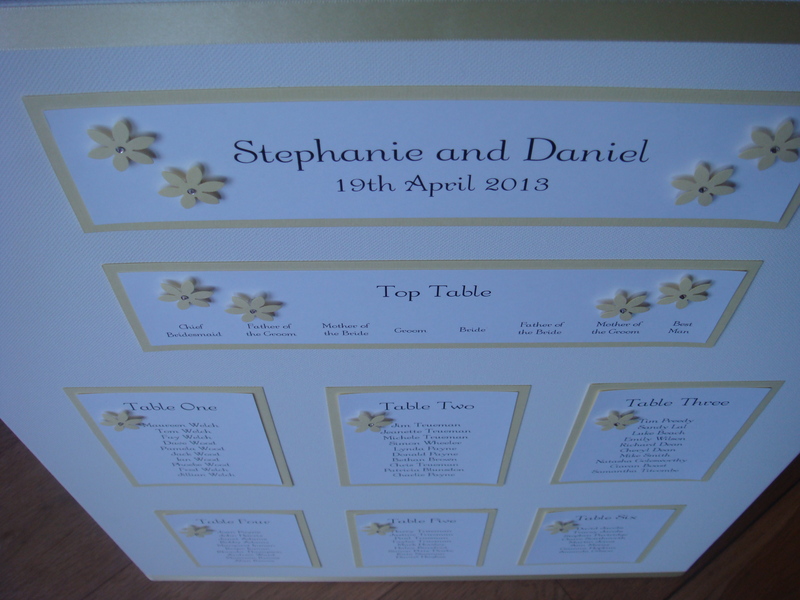 The customer had already received her invitations and this part was the on the day stationery with a matching table plan, place cards and table name cards. To work within their budget they decided to go for their Order of Service and Menu in the Adore range, but everything else was to be in the Boutique design. We recently had an order for our Glamour pocket wedding invitation in a lovely sage green on ivory card. This stationery design is popular with couples have a vintage themed wedding due to the lace, but it is also because of the lovely crystal embellishment we use (we can’t get a photo to show you how sparkly this really is). The design is made of luxurious lace, with a satin bow, the crystal embellishment is mounted on top of the bow and is finished with your wedding details. The inside of the pocket has the wedding insert backed onto sage card (this can be in any colour) and in the pocket below an RSVP card and envelope. All of our stationery designs are available in four different styles; pocket, wallet, folded or flat style and are priced accordingly. To view the price list and colour options for this design please visit the Glamour design page.